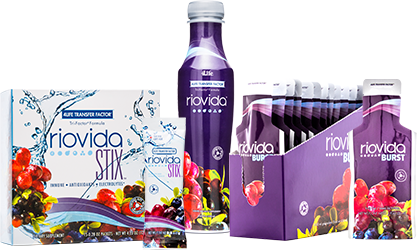 Riovida was developed to both excite the senses and nourish the body with an intense concentration of active ingredients. 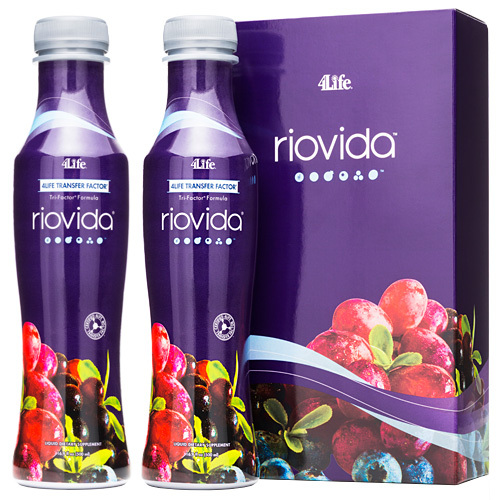 Offering an exotic blend of “superfoods”, the fruits found in Riovida support healthy cardiovascular, digestive, urinary, and immune system functions with powerful phytonutrient antioxidant called anthocyanins, omega fatty acids, flavonoids, ellagic acid, and tannins. Vitamin C and lactoferrin, a beneficial milk protein,were also added for their fortifying antioxidant properties and increased immune system support. Every day, your body is under attack. Not from something you can see, but from unseen threats like germs, toxins, stress and poor nutrition. Today’s world is a truly hostile environment that threatens to undermine health from every different direction. Even if you can’t see the problem, more than likely you have felt its effects. With every breath you take, you’re adding soldiers to a war going on inside your body; the free radical war. The process of oxidation, the very process by which you receive vital oxygen into your body, carries with it a nasty by-product called FREE RADICALS. And even the food you eat, broken down into carbohydrates, fats and proteins, goes through its own process of oxidation, creating more free radicals. Agents in the outside environment, such as cigarette smoke, fried foods, excessive sun exposure, car exhaust, certain drugs, radiation and air pollution, can also contribute to increasing levels of oxidation within your body. Free radicals are oxygen molecules that are missing a shared electron, leaving them unstable. These unpredictable molecules begin attacking cells, taking electrons away and damaging body cells in the process. On a small scale free radicals are normal, and actually necessary for the body to do repair work among cells and fight infection. But when this situation gets out of control, as it often does, the body goes into a state that’s referred to as OXIDATIVE STRESS. Fortunately, there is something you can do today to counteract the damage and take control of your health. To survive and thrive in such a hostile environment, you need a two-pronged solution that addresses your body’s most critical needs. First, support the immune system, bringing it back into fighting form with transfer factors. Second, prime the body with antioxidant support to help reserve the aging process going on inside your body. Transfer factors are some of the most unique molecules in the human body, performing highly specialized and critical roles within the immune system. Simply put, they are messenger molecules that carry information to immune cells all over the body. Supporting your body with transfer factors can be compared to the continuing education your receive as you progress in your chosen career. They give your immune system critical refresher courses. Transfer factors teach and train the immune system in three very important ways. Transfer factors educate the immune system to quickly identify invading germs, speeding up the recognition stage. An intelligent immune system must immediately mount an attach and destroy the threat. Transfer factors are able to decrease the response time and enable the immune system to more quickly defeat the enemy, shortening the duration of an illness. Transfer factors aid the immune system in remembering the specific makeup of each germ it encounters, ensuring a swift and strong defence the next time. The immune system combined with antioxidant support provides a powerful and effective approach to helping your body where it needs it most. A well-functioning immune system allows antioxidant supplementation to truly deliver the kind of support that your body needs to combat oxidative stress. The new combination of transfer factors and berry antioxidants such as acai, blueberry, pomegranate and elderberry is simply unsurpassed in the nutritional supplement industry today. Together they provide a one-two punch that allows you to feel better, deal effectively with stress, reverse the signs of aging and live a longer, more fulfilling life.